Investigators conducted a retrospective study to assess the association between alcohol consumed early in life with later development of severe liver disease. They used data from a nationwide population-based study conducted during 1969-1970 of all Swedish men conscripted into military service. During that period, conscription was mandatory in Sweden, and only 2-3 percent of men were exempted from conscription, mostly due to severe disabilities or disease. This study was based on more than 49,000 Swedish men, aged 18-20, who were conscripted at that time. Researchers matched personal identity numbers from the conscription data with records in the National Patient Register and the Causes of Death Register to establish whether participants had developed severe liver disease up to the end of 2009. Results were adjusted for body mass index, smoking, use of narcotics, cognitive ability, and cardiovascular capacity. Hazard ratios (HRs) during 39 years of follow-up of severe liver disease by alcohol consumption (grams per day) at the time of conscription in 43,293 Swedish men in 1969-70. The solid line represents HRs from linear-response Cox models and the short-dashed lines the 95 percent confidence intervals estimated from multivariable Cox models modelling alcohol consumption using fractional polynomials. Data indicated that alcohol consumption early in life was associated with an increased risk of developing severe liver disease. After 39 years of follow-up, 383 men had developed severe liver disease, which was defined as a diagnosis of liver cirrhosis, decompensated liver disease (hepatocellular carcinoma, ascites, esophageal varices, hepatorenal syndrome, or hepatic encephalopathy), liver failure, or death from liver disease. The risk was dose-dependent, with no sign of a threshold effect and was more pronounced in men consuming two drinks per day, about 20 grams, or more. Before adjustment for body mass index, tobacco consumption, the use of narcotics, cardiovascular fitness, and cognitive ability, the risk was significant for daily alcohol consumption as low as six grams per day. These results are only valid for men and need to be validated in women. “If these results lead to lowering the cut-off levels for a ‘safe’ consumption of alcohol in men, and if men adhere to recommendations, we may see a reduced incidence of alcoholic liver disease in the future,” says Dr. Hagström. Alexandre Louvet, MD, PhD, Service des maladies de l’appareil digestif, Hôpital Huriez, Lille, France, observes in an accompanying editorial that despite the huge disease burden, there are no approved treatments for alcoholic liver disease. According to the World Health Organization’s 2014 global status report on alcohol and health, alcohol-related cirrhosis is responsible for 493,300 deaths each year. Although there is no approved treatment, alcohol-related disease is theoretically 100 percent preventable, which makes the role of preventive measures central in decreasing the impact of excessive alcohol consumption on society. 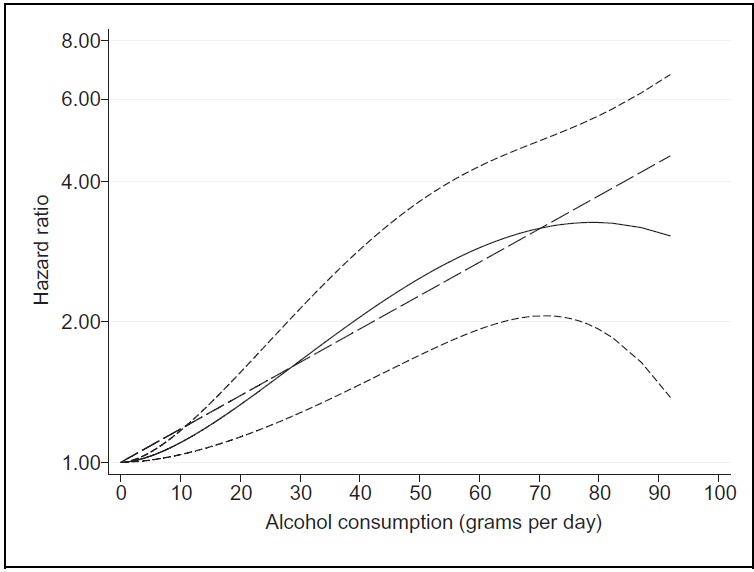 The article is “Alcohol consumption in late adolescence and severe liver disease later in life,” by Hannes Hagström, MD, PhD; Tomas Hemmingsson; Andrea Discacciati; and Anna Andreasson (https://doi.org/10.1016/j.jhep.2017.11.019). The editorial is “Managing excessive alcohol consumption at a population level: The earlier the better,” by Alexandre Louvet, MD, PhD, and Aleksander Krag (https://doi.org/10.1016/j.jhep.2017.12.015). Both will appear in the Journal of Hepatology, volume 68, issue 3 March 2018) published by Elsevier. Full text of these articles is available to credentialed journalists upon request; contact Sybrand Boer Iwema at +31 20 485 2781 or hmsmedia@elsevier.com. Journalists wishing to interview the study authors should contact Hannes Hagström at hannes.hagstrom@ki.se. To reach Alexandre Louvet for comment, contact Alexandre.LOUVET@CHRU-LILLE.FR.